German ornithological porcelain cup and saucer c. 1780 Ansbach ? Please refer to our stock # TBD00232 when inquiring. 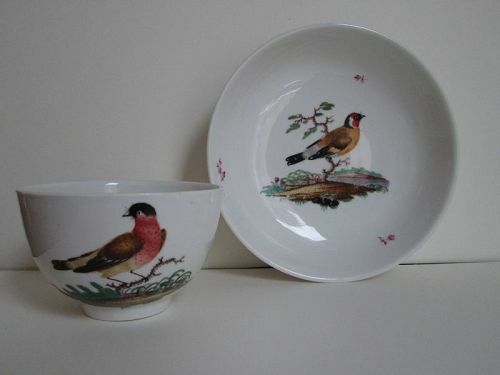 A fine porcelain cup and deep saucer decorated with hand painted birds sitting on braches near the ground. The cup and saucer are also decorated with randomly placed puce sprigs. Unmarked, but numerous examples of similar birds with puce sprigs are on marked Ansbach pieces. Saucer 5 ¼ inches (13.4 cm) diameter. Cup 4 inches (10 cm) diameter including the handle, 3 ¼ inches (8 cm) without it. Cup 2 inches (5 cm) tall. Condition: No chips or repairs. There is a very small crack on the bottom of the foot of the cup and staining associated with it on the inside of the foot. There is also a very tight crack near the base of the handle. Otherwise hardly any use and only very minor scratching on the inside of the saucer.